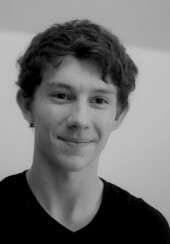 James has just completed performing in the world tour of Whole Hog Theatre’s adaptation of Princess Mononoke. As a Musical Director/Composer, James worked with Hôtel Teatro on the recent Curious Tales of the Brothers Grimm, and regularly writes music for dance and chamber ensembles. James was Creative Director at FreeRange in 2012-13. James moves to study Music at Manchester in September 2013.